Being designed ergonomicly with beautiful color, the 3D pen will be easy for kids to hold and be attractive to their attention. For safety and energy-saving, the 3D printing pen will automatically retract the filament after approximately 10 minutes of not being used. Adjustable 10 speed settings — fast speed is available for plane painting and slow speed is fit for three dimensional painting. With scientific heat conduction structure, the temperature of 3D printing pen&apos;s shell is significantly lower than similar products to avoid scald. Using the latest technology and optimized design, the filament is heated through pen body and discharge smoothly with no clog when create 3D objects. Two modes for your option — click the button to automaticly discharge and long press to manual discharge. IDRAWING 3D printing pen is perfect gift for children and helps improve their spatial thinking ability and encourages their creative imaginations. To avoid clogging, please use the matching consumables — 1.75mm PLA/ABS filament. Prohibited touching the nozzle and the heating parts around when the 3D pen is under working. 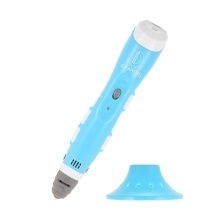 Kids should be accompanied and directed by an adult when using this 3D pen. 3D pen must be used together with USB cable. Please remember to quit the filament and power off before putting it back into the holder.